The 2018 Traditional Wrestling State Tournament returns to the Macon Centreplex on Feb. 8-10. Seven team champions and 98 individual champions will be crowned in the second year of the seven-classification format. In Class AAAAAAA, Camden County is going for its fourth-straight state championship, second-straight in the highest classification. The Wildcats rolled through last month’s duals tournament, defeating Archer 47-13 in the championship match. Camden County qualified wrestlers in all 14 weight classes, with eight wrestlers finishing first at the Section A tournament. The Wildcats have four defending state champions; Tyler Crew (113), Nicholas Krug (120), Brandon Orum (126) and Raydan Wilder (145) will all be looking for repeat titles. Camden County sports eight all-time titles across traditional and duals. Richmond Hill dethroned Alexander, the 2017 Class AAAAAA duals champ, at last month’s event with a 37-26 victory in the title round. It was Richmond Hill’s first wrestling state championship and avenged a loss to Alexander in the 2017 duals tournament. In last month’s championship matchup, Richmond Hill had eight wrestlers win their bouts in the finals. At the traditional tournament, the team brings a defending champion in Taylor Wilson (195), who won the 182-pound weight class last year. But Alexander will be a threat to win its second-straight traditional title as well. Buford was dominant in January’s Class AAAAA championships, its second in a row, and the Wolves are also the defending state traditional champions. Buford bested Ola in the duals final 50-18 and is sending 13 of 14 wrestlers to this weekend’s event. Ten of Buford’s wrestlers won their matches in the finals against Ola. Charlie Darracott won last year as a freshman at 138 pounds and will compete this year in the 145-pound class. Darracott sports a 36-2 record. Fellow sophomore Nick Stonecheck (132) is another defending champion and brings a 39-3 record to the meet. Jefferson of Class AAAA has been the most dominant wrestling program in the state, and it hasn’t been close; the Dragons boast 38 all-time titles across the two formats and 21 traditional state titles. 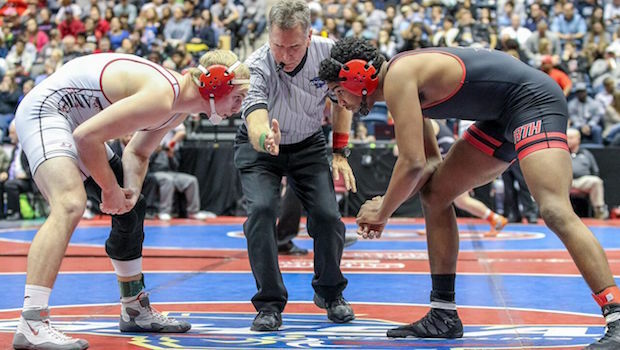 The team was characteristically business-like in rolling through the January duals championships, with its closest two matchups coming against West Laurens in the semifinals (50-24) and a game Gilmer squad in the finals (36-19). Jefferson advanced 13 wrestlers to this weekend’s meet, with six wrestlers taking home titles at Sectionals: Tyson Thurmond (106), Jarrad Blackburn (120), Ian Statia (126), Dawson Bates (132), Cole Potts (138) and Coy Strong (145). 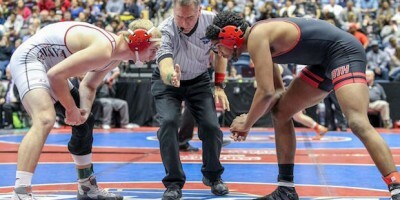 In Class AAA, North Hall entered the duals as one of the favorites and was able to upend defending champion Bremen 42-22 in the final last month for the school’s first wrestling state title. North Hall followed that up with an Area championship and is sending 10 wrestlers to the state meet, with seven wrestlers finishing first at Sectionals: Bremen will be back as well, sporting top contenders such as Noah Liles (170) and Koby Cook (160), who are defending state champs. Social Circle has also been unstoppable in Class AA since 2015; the team swept both traditional and duals titles for three straight years and look to be the favorite to do it once again. Toombs County challenged Social Circle in last month’s duals final but fell 36-22. Social Circle brings 12 wrestlers to the state meet with six Sectionals champions: Kyle Morris (120 pounds), Jackson Wheeler (132 pounds), Mitchell Thompson (145 pounds), Josh Engstrom (152 pounds), Douglas Peppers (160 pounds) and Rod Nunnally (285 pounds). In Class A, Commerce is another program looking to defend its dynasty. The team is looking for its fifth-straight state championships sweep, and with a 68-6 victory last month over Wesleyan for the duals title, another repeat looks likely. A championship this weekend would give Commerce its 11th wrestling state title between the two formats. Commerce sends 12 wrestlers to the event; Chase Forrester (160) and Cade Ridley (285) will try to defend titles in those weight classes.